The report from our first day, difficult to write with the boat bouncing around so much. America goodbye, the Four seasons is going home. Yesterday, on November 13th and after a year in America, having been shown at three big Boat Shows, twice in Fort Lauderdale and once in Miami, Four Seasons has started on her journey home to her port in the Netherlands. We considered having her shipped accross aboard a transport ship but it seemed somehow to make more sense for her to make her own way back home, via Bermuda and the Azores. Our dream of an anti-clockwise trip around the Atlantic, following the North route [the Viking route] will have become a reality. The crew list has undergone changes since the crossing to America. Joost, Peter’s son, and Jorrit van den Burg, First Officer aboard the cruise ship Eurodam, have taken the places of Jurgen and Bas. During the weeks prior to setting sail the boat has been minutely checked and, where necessary, Peter Wieringa and his assistant Luuk have installed replacement parts. On the fore and aft decks we have placed two extra diesel tanks. These bladder tanks as they are called, are thick rubber mattresses each capable of holding 200 gallons of diesel; enough for the longest crossing of 1700 sea miles between Bermuda and the Azores. Finally both propellors were replaced, the originals having been so corroded by electrolysis that it wasn’t considered safe to leave port with them. Yesterday, after filling all tanks with diesel it was time to leave. Let go! After three quarters of an hour passing the houses and palaces of Fort Lauderdale we turned the bows seaward to the Bahamas. So far, so good, perfect weather and a comfortable temperature. As we got out to sea the wind and waves were heavier than we had expected. The wind, abeam, strengthened to between 25 and 30 knots and big waves lined up to knock us about. The first loose objects flew through the wheelhouse. The door of the microwave opened and oven dishes flew to the ground. A less than well stowed whisky bottle exploded into a thousand pieces. While cleaning up, Joost cut himself on the glass so the first aid kit was needed too. The smell of whisky in the wheelhouse overpowered Jorrit, who found solace on the stern deck, feeding the fishes. He has since given up on the shelter of the wheelhouse or cabins and prefers the rear deck, wrapped up warm, wearing his life jacket and attached to the boat by his lifeline. I felt trouble coming too, caused by Four Seasons’ rolling and stamping and decided to take preventive action. Mumbling F*ck You, I inserted my middle finger into my throat and waited for the reaction. It was fast; my stomach emptied in two quick throws. Bits of apple. Right, better out than in, I was more or less myself again. In the meantime Joost had relieved himself of the banana he had just eaten. It left by the same route as it had arrived. But what of Peter, you ask, stoic as ever, nothing to report. So gentlemen, he announced, the cook gets his first day off. Things got worse. The bladder tank on the foredeck was moving, inching closer to the starboard railing. One of its straps was loose. Crawling on hands and knees as the sea was too rough for us to stand, and wearing our lifejackets, Joost and I made it to the foredeck and strapped the unruly tank back down. With 800 litres of diesel still inside it was impossible to get it back amidships. At the helm, Peter had brought the revs down from 1000 to 700. Speed has dropped from 8 knots to five and a half; we can’t go any faster, the stamping, bucking and crashing would be too much. This is how we sailed into the night. Peter was at the helm until ten o’clock, then I took a turn until six this morning.The original watch plan was in tatters, sea sickness meant we had to improvise. It is now Tuesday afternoon and One forty-five, Jorrit is still at his post on the stern deck but looking a bit brighter. 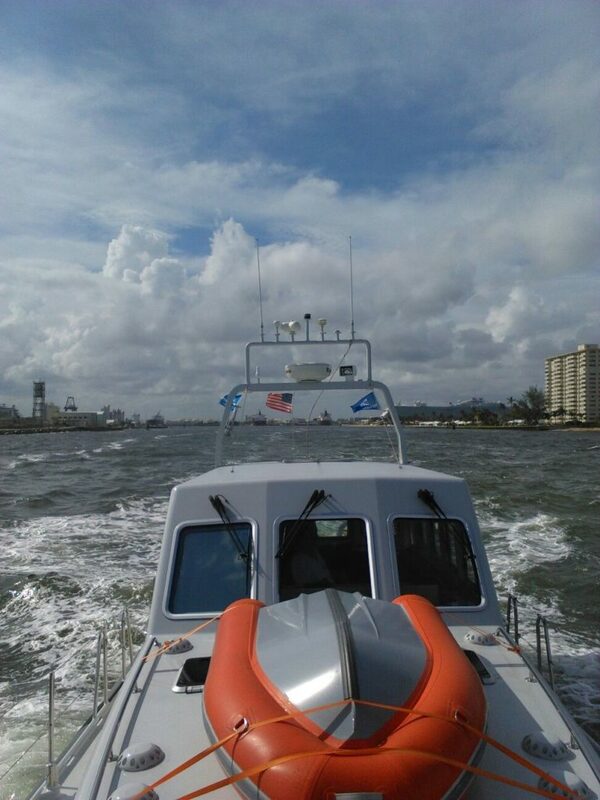 The sun is out and the wind has dropped but is forecast to strengthen to 25 to 30 knots from the NNO. This information was gleaned by Peter from a passing cruise liner. In a few hours we turn the corner at the Bahamas and head on a course of 060 for Bermuda. This will bring the wind ahead; less rolling, more stamping. That’s all for now folks, we’re on our way. IF THINGS ARE GOING TOUGH, THE TOUGH ONES ARE GOING! WOW!! Realism, writing is great……..safe in my own bed! !